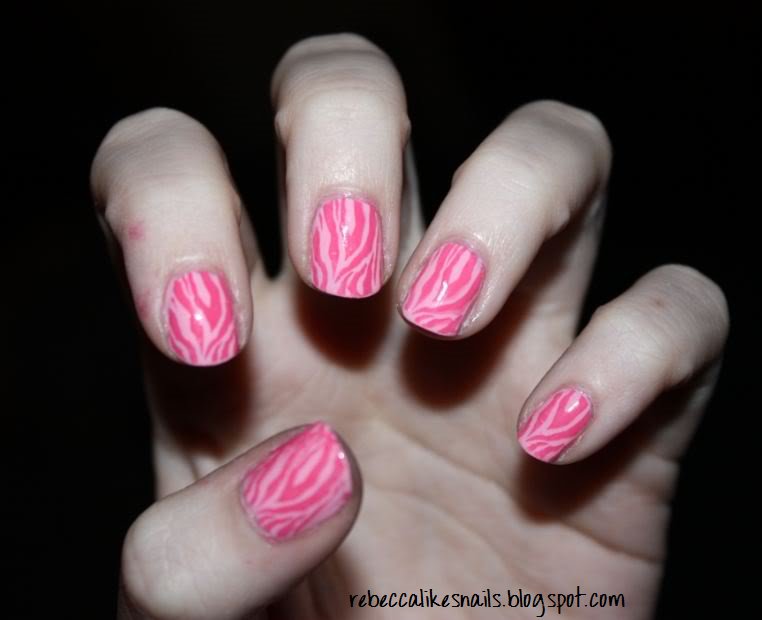 So for today, I have pink zebra for you! Excuse the ink stains on my index finger. This is sort of old, I forgot how much I like it! The base color is Wet N Wild Wild Shine, but I'm not sure of the name. I stamped with Sally Hansen Insta-Dry in Presto Pink. Before class this morning I went to Sally's and picked up a few (read: 4) polishes. 2 from China Glaze Tronica - Electric Magenta and Gamer Glam. Out of the 12 polishes I'm only into 3 or 4, and thankfully they had 2 there. I still need Techno Teal! And maybe Hyper Haute! I got Carnation Creation from the new Finger Paints collection. The ring is so cute! And I couldn't leave Orly's Royal Velvet from the Precious Collection behind. And Leslie, all Sally's are franchised so they are supposed to get the same stuff, hopefully they'll get some in soon! I'm going to checks Sally's here and see if they have the tronia collection. yeah it will be painful but as youll see in tomorrows post, im doing it!! This pattern and color combo = AWESOME !